With a legion of more than 127 million followers on Instagram, Dwayne ‘The Rock’ Johnson knows how to keep his fans entertained. Despite starring in pretty much every other film that gets released each week, it seem Dwayne just can’t get enough screen time – and we’re not complaining – so he’s always up for sharing more on the Gram. Then again, it’s no surprise he’s always up for sharing on social media – the 46-year-old actor reportedly gets paid $1 million per post to promote his films on his personal accounts. It’s not just for the sweet moolah that The Rock uses social media, though. He also uses his super presence to remind us all that, aside from the all the jokes and top bants with Kevin Hart, he’s a genuinely good guy (I think). Taking to Instagram earlier today, January 3, Dwayne shared a story about his humble beginnings. A good laugh at 40,000ft. Flyin’ back to Hawaii now to finish production on HOBBS & SHAW. Looked down at my plate and started to laugh at my plain grilled chicken and white rice and had an epiphany. He may have shared it from what looks like a private jet – he’s earned it, after all – so it’s not exactly the same. But nonetheless, you can’t argue with his hard work and determination, and the results. As he states, Dwayne is currently finishing production on Hobbs & Shaw, a spin-off of The Fast and the Furious franchise. In it, he plays Luke Hobbs, a US diplomatic security agent, who teams up with Jason Statham’s Deckard Shaw and his sister Hattie – played by Vanessa Kirby (Mission: Impossible – Fallout) – who is an MI6 agent. 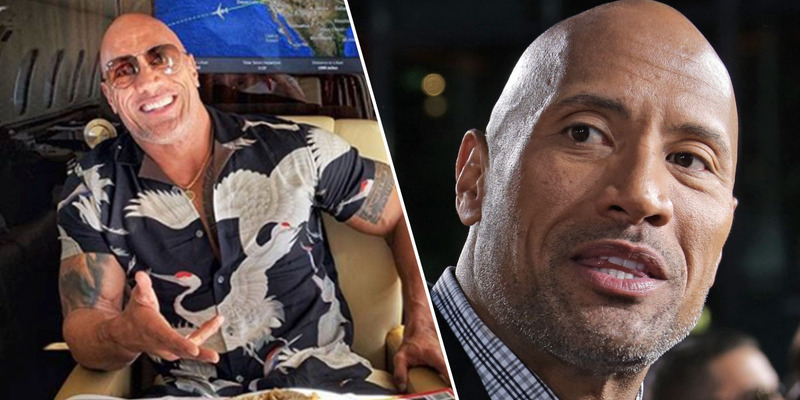 This latest Instagram post proves The Rock has not forgotten that he’s not always had it so good. In December, he further proved this by granting wishes to a group of young children from the Make A Wish Foundation, Rays of Sunshine Foundation, and Starlight Foundation. In a heart-warming video posted to his Twitter account, the Fast and Furious actor surprised a group of children by hanging out with them on set, sharing gifts, and tucking into some food together. I don’t know why things happen to kids the way they do. Why they get hit with hard times. I don’t know why things happen to kids the way they do. Why they get hit with hard times. The actor also shared some homemade cookies with the kids, adding ‘I’ve got the best job in world. This kind of stuff is easily the best part of my fame’.